Friedrich VDE Ratcheting Cable Cutter 1000VInsulated as instructed for IEC 60900:2004 regulations. - Ergonomic grips on bottom handle are spaced at 1⁄2" increments to act as a quick pipe measuring scale. - “Burr-less" cutting operation provides a square cut. - Intended materials: Plastic (PVC, CPVC, PP, PEX, PE, rubber hose) and multilayer tubing. 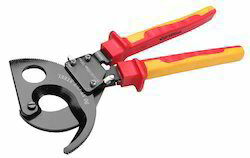 Our range of Ratchet Cable Cutter Pliers are available in different lengths and diameters to serve diverse applications and are made of premium quality. 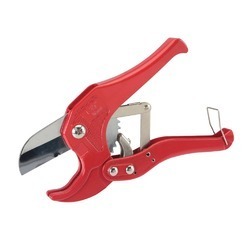 These Ratchet Cable Cutters are highly durable and have long lasting functional life . To give long service life, the design of these compact cutters is based on a simple ratchet mechanism. Simple controls and sure ratcheting action makes working with them easy. Ratchet Tube Cutter 1/8" - 5/8"
Features :The durable telescopic tube cutter accurately cuts copper tubing. - Four roller tracking system keeps tube from threading. - Smooth turning of adjustment knob. - Full – stop feed system prevents wheels & rollers from coming into contact. One-hand operation using ratchet principle. Two-stage ratchet drive for easier cutting. Cuts smoothly and cleanly with out crushing. Can also be suitable for stripping.